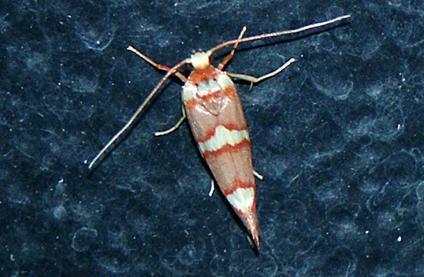 This adult moth has forewings which are brown each with a pale yellow band outlined in orange across the middle, and other pale yellow patches at the base, the tornus, and the apex. The hindwings are plain brown. The wingspan is about 2 cms. Moths of Australia, Melbourne University Press, 1990, fig. 28.18, p. 298. LeapFrogOz, Kuranda, 2015, p. 99. Volume 28 (1903), p. 90.